What is Turf Toe Injury? 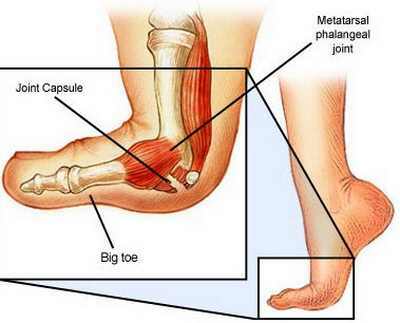 Turf Toe is medically termed as metatarsalphalangeal joint sprain. 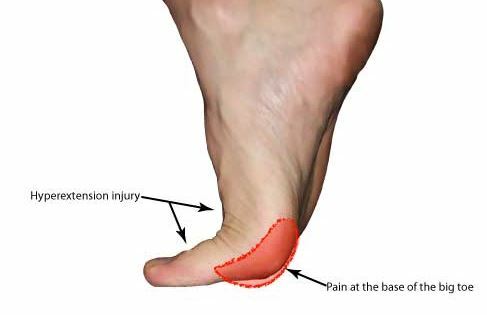 It is an injury, which is painful, located at the big toe base and that occurs most often in athletic persons who either play soccer, baseball or football and the like. It is soft tissue injury in the big toe joint. Other experts would define it as a sprain to the large toe joint’s ligament. Turf toe, anatomically speaking, works as a hinge that permits the up and down motion. It is often used whenever one walks or run. The turf toe will help in propelling yourself forward by means of pushing off the big toe and making your weight be shifted to the other foot. An injury in the turf toe is primarily due to hyperextension, when one extremely bends the big toe joint in an upward motion, or hyperflexion, when one extremely bends the big toe joint in a downward motion. This will lead to pain upon weight bearing and sprain of the ligaments that surround the big toe joint. 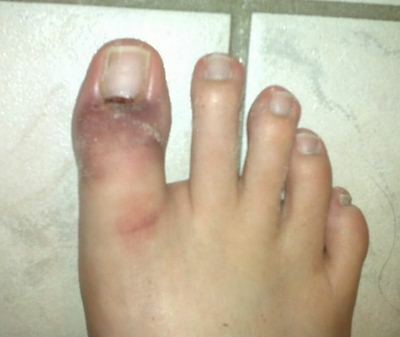 Bruising at the ball of the foot and at the top of the big toe. You must take note that not everyone will be able to experience the symptoms mentioned. The most common amongst the symptoms mentioned is pain. At first the pain is mild and tolerable until it becomes worse. These tests are necessary to detect the type and kind of injury or damage to the bone or ligaments. It will provide a clear picture and will tell the doctor the necessary medical steps to be done. Persons diagnosed with turf toe injury are through the synonym PRICE treatment meaning Protect, Rice, Ice, Compression, and Elevation. This is often done for immediate treatment. It is effective to reduce the pain and swelling episodes. You can also be prescribed with medication such as anti-inflammatory and analgesics. Anti inflammatory works to reduce the inflammatory symptoms while analgesic medications work to reduce the pain. Examples of medications include Ibuprofen, Aspirin, Acetaminophen or Naproxen. Surgery, as protocol, is the last option to be considered, it is only needed when there is a need for repair especially when the ligament is completely torn or there is a bone fracture due to the injury of the ligament. The area will be then casted or splinted until it recovers. After treatment, the next step is rehabilitation. It is the process of restoring the person’s maximum strength after the injury to gain self-sufficiency and function as normally as possible. This kind of exercise will help with the dexterity, strength and flexibility. You just need to sit on a chair then place a piece of towel on the floor and insert the towel between the floor and your feet. Then you grip the towel with the use of your toes. You then raise your feet slowly from the floor and hold the towel with both hands. You do this for ten seconds and then release the towel. Repeat the same procedure for about five to seven times. This kind of exercise will help you go back to pre-injure state. What you do is you sit on a comfortable chair with your feet, in front of you, flat on the floor. With your toes kept flat, lift the arch of your foot up. You must do this without rolling your foot towards the outside portion. Hold the position for about five second and release and do it again. This kind of exercise will also help you build dexterity, flexibility, and strength. You need to place marbles and bowel on the floor by the use of your bare foot. You just need to use your toes to pick each marbles and drop it to the bowl. Do this until all the marbles are inside the bowl and repeat the procedure. Braces can also be used. It protects the big toe from injury and restricts its movement. It can be also termed as toe splints. With the use of the braces, it is effective in lessening the pain. With the use of toe splint, the second toe will help protect the big toe from injury and lessen the pressure that it gives out on the neighboring toe. When one uses braces, one is expected to use lotion which is specially applied in irritating areas to reduce irritation. Before returning to the normal physical activity, most often it is required to tape the toe. By taping the turf toe, you will prevent recurrence of the said condition. It is through the use of a tape, where loops of 1 to 2 centimeters wide piece of athletic kind of tape is looped around the dorsal surface to the plantar surface of the patient’s affected foot. The turf toe inserts are put in the front portion of the foot. In this case, the normal foot can move without making the toe move around and bear much weight. It usually fit inside a shoe and it keeps the toe straight. There are also turf toe inserts that are padded for extra comfort of the user.